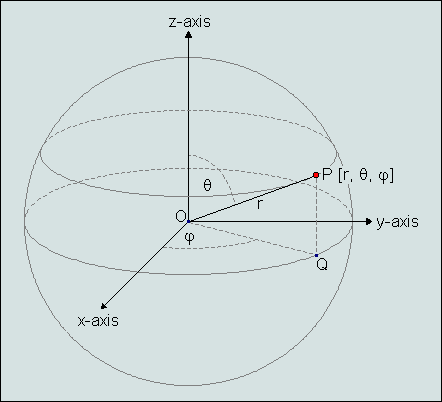 The spherical coordinate system specifies the position of a point P by the combination of its distance to the origin (radius r), the angle φ between the x-axis and the line OQ, and the angle θ between the radius and the z-axis. Note, that the angles are positive in counter-clockwise direction and negative in clockwise direction. The values of the angles are measured in radians (0..2π) or degrees (0..360°). To specify a particular point in a spherical coordinate system, you indicate the coordinate values in the form [r, θ, φ]. A point in the spherical coordinate system. Please note that the angle φ corresponds to the longitude in geography, and the angle θ corresponds to the colatitude (= 90° - latitude). Further, one should be aware that the convention for naming the two angles is sometimes reversed in the literature, which may cause unnecessary confusion.